I hope that title doesn’t confuse you with what’s happening on this blog and what’s happening in the War Room, but I have decided it is time to get serious about baking around here. I’ve baked French bread for years (so incredibly easy and absolutely my favorite thing) and have done the occasional birthday cake from scratch. I’ve also tried a few savory biscuit recipes that were delicious and had a [short, very short] span of time during which I baked a loaf of wheat bread every week to use for turkey sandwiches. 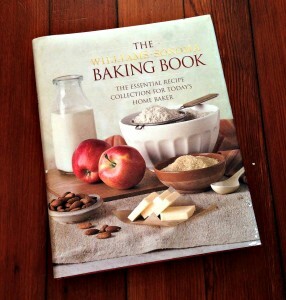 But I have not been a serious student of the science of baking. Cooking is one thing, baking totally another. With cooking, it’s easy to follow a recipe the first time you make something and then change it up based on your own tastes, combine it with another recipe, use it to inspire your own creation, etc. You mess with cooking and you have a bit more wiggle room. That’s not to say there’s no such thing as a cooking disaster, mind you. Ask me about the time I tried to boil chicken breasts. No, not bRoil . . . boil. A method that should be reserved for crawfish, trust me. But if you mess too much with baking, you don’t even have something to taste before you dump it in the garbage. It’s all about temperature and timing and yeast and rising and all sorts of things that take patience and, you know, actual measurements. So I’ve decided to branch out and a) try new recipes and b) actually learn something about baking. Granted, that person probably will have just asked about my allergy shots that I have to store in the fridge, but whatever. My first assignment? Onion & Shallot Muffins. Okay, so I technically skipped the “Cookies & Bars” section of the book, but I’m not really a sweets person and wanted to save that section for closer to the holidays when I can bake something, try it, and share the rest instead of having it go to waste. They were delicious. So delicious that I didn’t take a picture of them, if you can believe it. Almost two years in and I’m still getting the hang of this whole blogging thing. I learned: That shallots have “a reputation for elegance” because of their shape. Well, yes. Of course. I can’t imagine disagreeing with that. 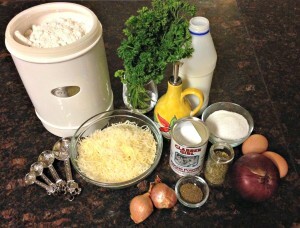 Recipe review: The recipe was really easy to follow. Muffins don’t need to rise and take about half an hour to bake, so you don’t need a ton of advance planning for this recipe. These were delicious, too—definitely going into the rotation around here. Next time: The recipe calls for red onion + shallot. I think I’ll use Vidalia onion + shallot instead because I love Vidalia onions and think they’ll add just the right amount of sweetness. Call for suggestions: The syllabus is still very much in flux over here, so please share any websites / cookbooks / etc. that might prove helpful. Much appreciated!